This vibrant silk kimono blends both Japanese and Indian dress for a cozy fashion statement. Adorn yourself in the vibrant colors of India and sleek lines of Japan with this upcycled turquoise silk sari kimono. Blending the traditional dress of both cultures, each garment is made from vintage saris and tailored in a classic kimono shape for a one-of-a-kind look. Upgrade your leisure time wardrobe, or wear it out in the world as an extraordinary statement piece. Made in India. Bright beautiful color, light and soft on the skin. This is a great wrap after an evening bath or shower. This will be tucked in my purse as a just in case layer! I actually wear this like a jacket. I wear it to work. I received several compliments from my co-workers. Beautifully made, great quality, vibrant colors! It's very light weight, to lightweight for me so I had to return it. And be aware there is no belt. loose fitting, easy to pack, throw it on for an evening out or after a bath. so versatile! 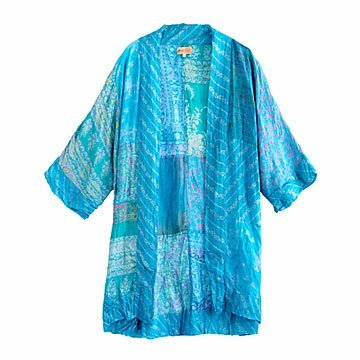 I truly do like this kimono, but it is listed as being turquoise (with some light green). It is not. It is TEAL ...... much, much, much darker than it is shown. I was really looking for something in a lighter color. That being said, it is a nice item and I do like it, but I would have loved it if it had been the right color. I bought this as baby shower gift for my niece who was having her first child. She loved it.